It’s very late at night, still, quiet, and the night sky beckons to me, teasing me to unlock its secrets. With moments like this I get lost in my thoughts of the cosmos and the incredibly violent events happening as we sleep, light years away from our safe little corner of the universe. What better time than to hunt for supernovae? I’ve been a big fan of the Galaxy Zoo project since its inception (here is a link to my first essay). It is a great way for the public to contribute in a meaningful way with an actual astronomical project – classification of galaxies. The organization started another project called Galaxy Zoo - The Hunt for Supernovae where you can help identify supernovae in a large collection of candidate images from the Palomar Transient Factory (PTF) survey. PTF identifies anything that changes in the sky, a variable star, an asteroid in motion, or a supernova. Built in the 1940s, the telescope used for PTF is the Samuel Oschin 1.2 meter at the Palomar observatory. In searching for supernovae, the PTF images the same galaxies twice per night, every five nights. The idea is to capture changes in the sky. The supernova hunt uses human classifiers because, believe it or not, the human brain has innate abilities in making such visual classifications and can do so better and more reliable than a computer can. So we bipeds are of some use after all! 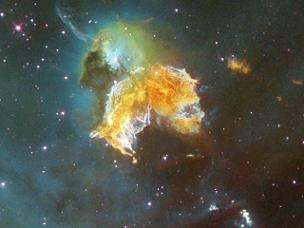 A supernova represents the end of stellar evolution. At the end of a massive (several times the mass of our Sun) star’s life, there is an explosion of such intensity that it can easily outshine its host galaxy. Our Sun on the other hand is too small to result in a supernova and will fade out with a whimper as it runs out of fuel to power the nuclear fusion at its core. The GalaxyZoo supernova project serves up images of possible core collapse supernovae and type 1A supernovae. The website provides complete instructions and examples of how to classify these amazing astrophysical objects. It is both a fun and educational way to pass time. So if you’ve been an armchair astronomer up until this point, consider doing something real and join up today and start your own hunt for supernovae! D: thank u for turning me onto this. I already joined the supernova search and also galaxy classif. It is fun to think I'm doing something useful for astronomy. I also got my 12 yo. son involved so we're doing it as a family.. .